Robert De Rustafjaell --- changed from Robert Fawcus-Smith in October 1894 --- first visited the site of Cyzicus on the south coast of the sea of Marmara in 1900. He quickly obtained a firman for excavating and initiated work in the summer of 1901. 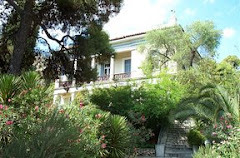 However he needed additional archaeological expertise and approached the British School at Athens. 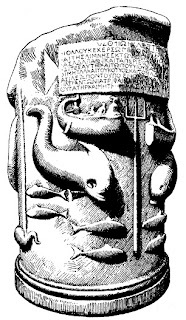 Dost remember the Poseidon monument, a pedestal or altar with tridents and fish and galleys thereon, which was represented on several of De R.'s photographs? We went this morning and dug it out and made paper impressions of the inscriptions. And Hasluck and I took the village watchman, a Tcherkess from the Caucasus, who patrols the fields armed with an old musket, and went to the amphitheatre, a most beautiful spot outside the walls. A stream has burst through the mighty fence and careers through the arena; a great part of the walls has fallen; but great piles of masonry still tower to heaven, and the hillsides are full of overgrown vaults; the whole hollow is a mass of luxuriant thickets, bay, arbutus, ivy and honeysuckle; sprays of unripe blackberries hang over the water. 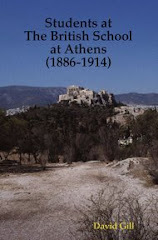 In the end Bosanquet decided to excavate at Palaikastro on Crete, but Hasluck and the school architect, Arthur Henderson, continued to plan the site and record inscriptions. Hasluck, F. W. 1901/02. "Sculptures from Cyzicus." Annual of the British School at Athens 8: 190-96. —. 1904/05. "Notes on the Lion group from Cyzicus." 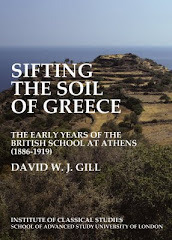 Annual of the British School at Athens 11: 151-52. Hasluck, F. W., and A. E. Henderson. 1904. "On the topography of Cyzicus." Journal of Hellenic Studies 24: 135-43. Hasluck's image of the statue base of Antonia Tryphaena, excavated by De Rustafjaell at Cyzicus in 1901.